"Palengenesis [ roughly equivalent to Rebirth ] is the resurrection of the soul from the material organism. The human body is the Hermetic bottle . By palengenesis, however, the spiritual elements can be reassembled by alchemical art and the Three of Life caused to grow again within the human nature." Astrology was one of the seven sacred sciences cultivated by the initiates of the ancient world. It was studied and practiced by all the great nations of antiquity. The origins of astrological speculation are entirely obscured by the night of time which preceded the dawn of history. There are traditions to the effect that the astrological science was perfected by magician- philosophers of the Atlantean Period. One thing is evident, Astrology descends to this late day adorned with the discoveries and embellishments of a thousand cultures. The history of Astrology is indeed a history of human thought and aspiration. The readings for the planets as given in the cuneiform tablets of Sargon are still used by the astrologers of this generation. Only such modifications and changes have been made as the shifting foundations of cultural standards necessitated. Two distinctive schools of Astrology have been recognized from the beginning of the historical period. With the decline of the late Atlantean and early Aryan priesthoods and the profaning of their mysteries, what are now called the sciences were separated from the parent body of religious tradition. Astrology and medicine were the first to establish independent institutions. The priests of the state religions no longer exercised a monopoly over the prophetic and medicinal arts. Beginning with Hippocrates new orders of soothsayers and healers arose who were entirely ignorant of the fundamental unity, yes, identity of the spiritual and physical sciences. The division of essential learning into competitive, or at least non- cooperative, fragments destroyed the synthesis of knowledge. Frustrated by division and discord, the whole structure of education broke into innumerable discordant parts. The science of medicine divided from its spiritual source deteriorated into the quackery and leechcraft of the Dark Ages, a condition of affairs so sorry that the Hermetic physician Paracelsus was moved to say, "Fortunate is the man whose physician does not kill him." Astrology was likewise corrupted into horoscope mongering. Divorced from its divine purpose it drifted along, performing a halfhearted and pointless work which consisted for the most part of the bleating forth of dire predictions and the compounding of planetary salves against the itch. A small group of enlightened and educated men preserved the esoteric secrets of medicine and astrology through those superstition ridden centuries we now call the Middle Ages. Of such mental stature were the Rosicrucians who honored Paracelsus as one of the chief of their "mind." Through Paracelsus and the Rosie Cross the spiritual secrets of nature were restored to the chief place among the ends of learning. Knowledge was interpreted mystically and the profane sciences were reflected as merely the outward forms of inward mysteries. The secrets of mystical interpretation were concealed from the vulgar and given only to those who yearned after things which are of the spirit. The Mystical Divinity [ Theology ] of Dionysius the Arepagite * became the textbook of an ever increasing number of devout and God-loving men and women who saw in all outer forms and institutions the shadows and semblances of inner truth. The modern world which sacrificed so much for the right to think has grown wise in its own conceit. Educators have ignored those spiritual values which constitute the priceless ingredients in the chemical compound we call civilization. Material science has become a proud institution an assemblage of pedagogues and demagogues. There is no place for mysticism in the canons of the over-schooled. Hypnotized by the strange fascination which matter exercised over the materialist, modern savants ignored the soul, that invisible reality upon which the illusions of the whole world hang. It was Lord Bacon who said, "A little knowledge inclineth men's minds towards atheism, but greatness of knowledge bringeth men's minds back again to God." This wonderful quotation expresses the tempo of the modern age. A disillusioned world saddened over the failure of material things is crying out again for those mystical truths which alone explain and satisfy. The return of mysticism brings with it a new interest in astrology and healing. Mysticism brings with it a new standard of interpretation. To live up to the exacting demands of a mystical interpretation all branches of learning must be purified and restated. To the mystic, astrology is not merely prediction or even giving of advice, it is a key to spiritual truths to be approached philosophically, to be studied for its own sake. Although science has classified, tabulated, and named all the parts and functions of the body, it cannot describe or explain what man is, where he came from, why he is here, or where he is going. In the presence of ignorance concerning these vital subjects, it is difficult to appreciate an elaborate learning in secondary matters. The initiates of antiquity were concerned primarily with man in his universal or cosmic aspect. Before a person can live well he must orient himself, he must know in part at least the plan of living. With this knowledge he can then cooperate with "the plan," and the philosophic life recommended by Pythagoras is merely to know the truth and to live it. Scientists looking for the cause of those energies which motivate and sustain the world have decided by a process of elimination that these causes must lie in a subjective structure of the universe, the invisible sphere of vibrations. So the modern fancy is to ascribe to vibration all that cannot be explained in any other way. The moment we acknowledge the universe to be sustained by an invisible energy which manifests through the law of vibration, physics becomes super-physics, physiology becomes psychology, and astronomy becomes astrology. Astrology is nothing more nor less than the study of the heavenly bodies in the terms of the energies which radiate from them rather than merely an examination of their appearance and construction. The original Rosicrucians held to a theory generally discarded by men of science and now known as the microcosmic theory. 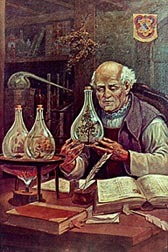 Paracelsus was the most prominent exponent of this concept of universal order and relationship. He said, "As there are stars in the heavens, so there are stars within man, for there is nothing in the universe which has not its equivalent in the microcosm." (the human body). In another place Paracelsus says, "Man derives his spirit from the constellations (fixed stars), his soul from the planets, and his body from the elements." It is quite impossible for the most highly trained scientist to examine with any adequate appreciation of values the whole infinite diffusion of the cosmos with its island galaxies and incomprehensible vistas of immeasurable space. Yet the whole of the pageantry of worlds is evidently dominated by all- sufficient laws. Man himself is more compact though possibly in other ways hardly less difficult to analyze. The cells in the body of man are as countless as the stars of heaven. Countless races of living things, species, types, and genera are evolving in the flesh, muscle, bone and sinew of man's corporeal constitution. The dignity of the microcosm gives the scientist some sense of the sublimity of the macrocosm. By the use of astrology it is possible to discover the interplay of celestial forces between the macrocosm and the microcosm. The centers in the physical body through which the sidereal energies enter were discovered and classified by the ancient Greeks, Egyptians, Hindus, and Chinese. There is great opportunity for work in examining not only the physical body itself but the auras which extend from the body forming a splendid garment of cosmic light. The last few years have witnessed exceptional progress in that branch of medical science which is called endocrinology or the study of the structure and function of the ductless glands with research into therapeutic methods of treating derangements thereof. These glands are now accepted as the regulators of the physical function, the governors and directors of bodily structure, profoundly significant not only in their physical reactions, but also their effect upon mentality, emotion, sensory reflexes, and the so-called spiritual or metaphysical functions. Nearly all endocrinologists admit that the pineal gland is the most difficult to understand and the most difficult to treat. It can now generally be reached only by treating the other glands over which it acts in the capacity of generalissimo. The physical functions of the glands are now fairly well classified but there will unquestionably be much revision of the present opinions. Physicians are willing to admit that the function of the glands does not end merely with their effect upon the body but scientists are not prepared to make any pronouncements beyond the field of material reaction. It is especially significant therefore that through a combination of clairvoyance and astrology it is possible to examine the ductless glands and discover the metaphysical elements in their functioning. The modern clairvoyant uses the same method for his work as was used by the initiate priests of the ancient world, and like those older adepts he makes contributions to the sum of knowledge which are only discoverable to the materialist after centuries of ponderous experimentation. The work which follows is a spiritual record of the function of the pituitary body and pineal gland. I feel that the researches carried on by Mrs. Max Heindel are a definite contribution to the subject of endocrinology that should be preserved for the use of all students of medicine and the occult sciences. The text of this article comes from the preface to Augusta Foss Heindel's study of Astrology and the Ductless Glands. *This work is dated from the late 5th to the early sixth century. He was quoted frequentley by both Eastern and Western theologians, e.g., St. Gregory Palamas and St. Thomas Aquinas. Of all theologians, Dionysius is one who has stressed most the inaccessibility of God's divine essence. Yet, at the same time, he seems to be the one who has given countless names to the accessible attributes or energies of God.